Welcome to another installment of RETRO REVIEW, where we take a look at films made before the year 2000. 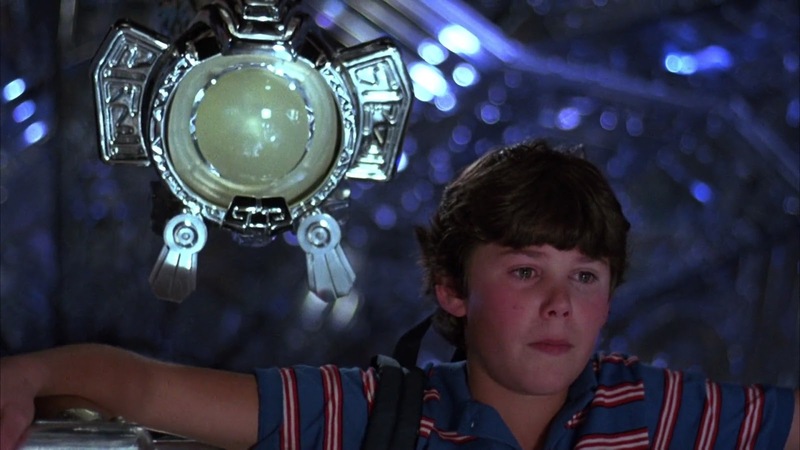 Today we look at a forgotten Disney adventure, 1986's FLIGHT OF THE NAVIGATOR. Howdy fellow film freaks, Robert here. Flight of the Navigator comes from a strange time in the history of Disney. There's something kind of schizophrenic about this movie. The film bears plenty of the hallmarks of the kids adventure movies that Disney produces today -- plucky young hero from a perfect family, adults that may or may not have our hero's best interests at heart, loads of false drama -- and yet the film is rather edgy compared to the Mouse's more recent projects. Or it tries to be, in true 80s fashion. Twelve-year-old David Freeman (Joey Cramer) is living the typical kid life in Fort Lauderdale, Florida, in 1978. He's got a bratty kid brother who drives him crazy, parents who love him but typically take the kid brother's side, and a crush on a girl who has yet to notice him, just to round things out. While walking through the woods trying to sort out his troubles, David falls into a ravine and is knocked unconscious. After he comes to, he hurries home only to find that his parents no longer live there. David soon discovers that it's no longer 1978, but 1986, and yet he hasn't aged at all. At about the same time, a team of NASA scientists discover a strange silver spacecraft floating near some wrecked power lines. Since this is the sort of thing the folks at NASA are in to, they take it back to Cape Canaveral for study. Spoilers: David and the spacecraft are connected. The film takes a few convenient leaps to move David into his place in the story. He's quickly reunited with his (now eight years older) family, but passes out from the shock, which gets him put in the hospital. Tests are run. The tests show strange results! NASA catches wind of this, and David winds up at Cape Canaveral as well, under the care of the extremely patronizing Doctor Faraday (Howard Hesseman), the only person in all my years I've ever heard use the phrase "remote control wand". But it's not so bad; he also meets Carolyn McAdams (Sarah Jessica Parker, long before she was who she was). Carolyn fills the role of the requisite "nice" grown-up in this story, but she's not completely flawless. She happens to be a Twisted Sister fan, showing she knows what she wants to do with her life. During his time at NASA, David is subjected to yet more testing, which involves him reclining on an examination couch while a group of scenery-chewing adults (led by the good Doctor Faraday, who came hungry to the exam scene) spout technobabble as the mystery deepens. David decides to escape. Carolyn helps. This brings David into contact with the spacecraft (finally), and the two set out on a magical adventure as the titular Flight gets underway. Look, it's a Disney movie; any given one of those brings enough corn to feed Indiana for a year. Flight of the Navigator is no exception. Most of it comes in the form of Max, voiced by Paul "Pee-Wee Herman" Reubens, who took the name of "Paul Mall" for this project, for some reason. Max is the robot/computer thing that inhabits the spacecraft, and eventually becomes David's bestest friend in true Disney fashion. When the two first meet, Max is all robotic business, and even a little scary, given that he looks like a floating orange eye and has a very deep voice. After he performs a "mind transfer" on David for story related reasons, however, Max begins "acting like a human", in David's words. Which in this case apparently means laughing like a buffoon, throwing out puerile insults and spouting advertising jingles. It's a marked changed from the old Max to say the least, and while it's funny at first, it gets old quickly. Thankfully the movie throttles Max back a bit before the end. Max and David have a grand time running from Doctor Faraday and the NASA goon squad for a while, until it's time for David to go home -- home-home, as in back to 1978 -- which he might not be able to do but is actually able to do. David rejoins his family and tells them he loves them. Cue Disney Magic, roll credits. So what we have here, then, is a well-known forest -- a kid gets into a Sticky Situation, which turns into the Adventure of a Lifetime -- with some very memorable trees. First, this is the only Disney movie aimed at kids that I know of that contains profanity. It's just a couple of S-bombs and a "goddam", but still. Cussing in a Disney movie is kind of like cussing in church, isn't it? Even the relatively tame words gain weight by context. Second is pre-mind transfer Max. He's a robot as kids movies typically define it, but he's still kind of cool in his own right. But what makes this movie stand out for me is that it has a happy ending. A somewhat lame ending, yes, but a happy one. We're used to sci-fi adventures ending in disaster, or at best, bittersweet sadness a la Interstellar. It's a shame that Flight of the Navigator never manages to feel like David is ever in any real danger, but there's still a sense of wonder here that is usually missing from adventure movies of this type. So if your kids have a tolerance for older movies, or you just want to break up your steady diet of nihilistic sci-fi, try Flight of the Navigator. It's typical Disney, but that's not necessarily a bad thing. Flight of the Navigator is rated PG.